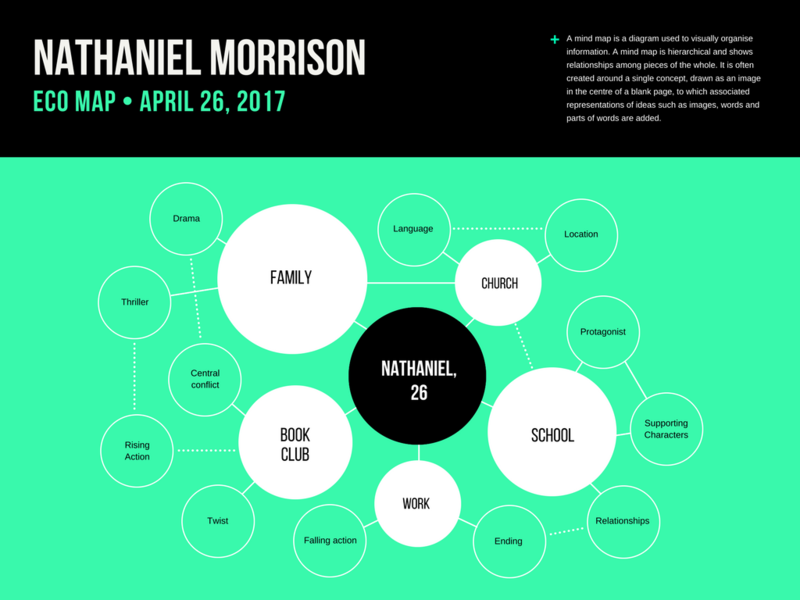 An ecomap is a graphical representation of the personal and social relationships between an individual or family and their environment. 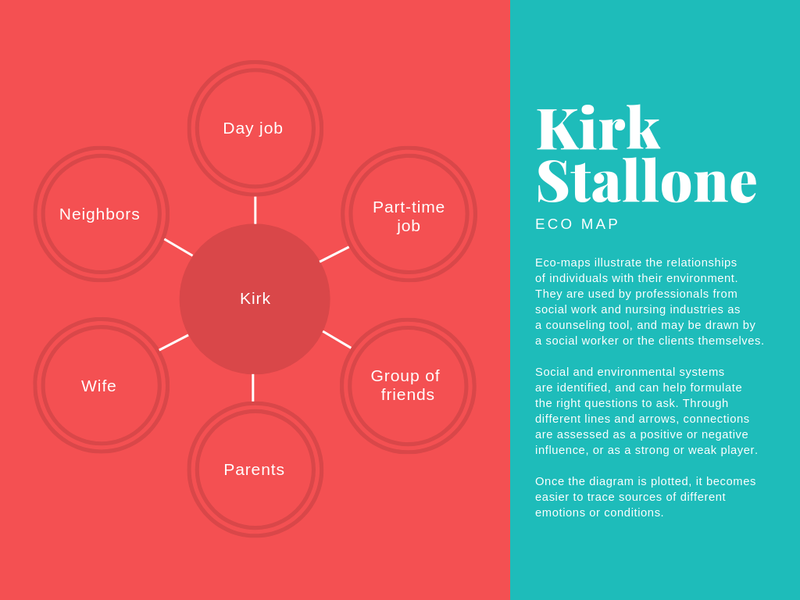 Often used by counselors and social workers, ecomaps can help identify stressors or causes of anxiety and depression. This chart goes beyond merely identifying biological relationships but also takes external connections (and the quality of said connections) such as friendships, clubs or institutions, into consideration. 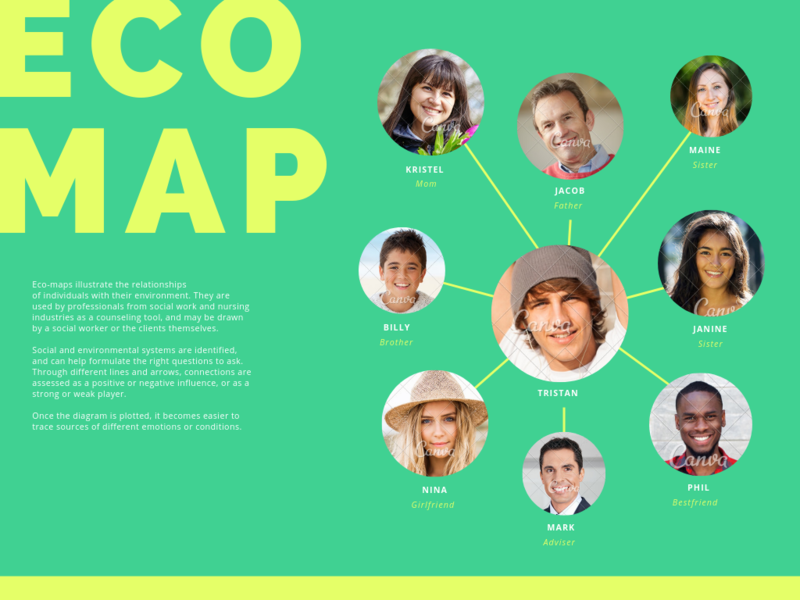 Create professional-looking ecomaps with Canva’s ecomap maker. As an online platform, it runs anywhere as long as you have an internet connection. You can create an ecomap from scratch or, if you want to be done quickly, choose and modify an existing template. Canva requires no design skills or experience so you can leave the designing to us and concentrate on helping others navigate their complex relationships. Create a new Canva account to get started with your own ecomap design. 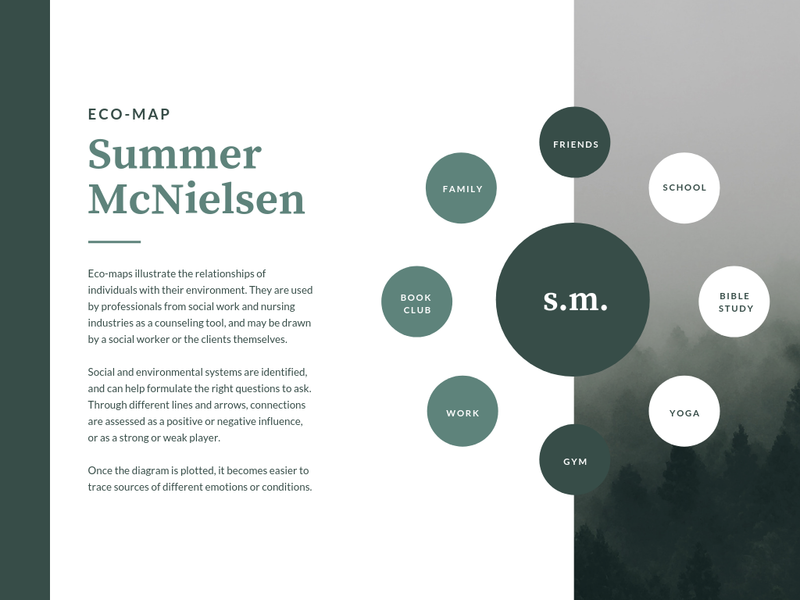 Create professional-quality ecomap designs with minimal effort by using Canva’s ready-made templates. Once you’ve chosen a starting design, it’s a simple matter of customizing the template as much or as little as needed. 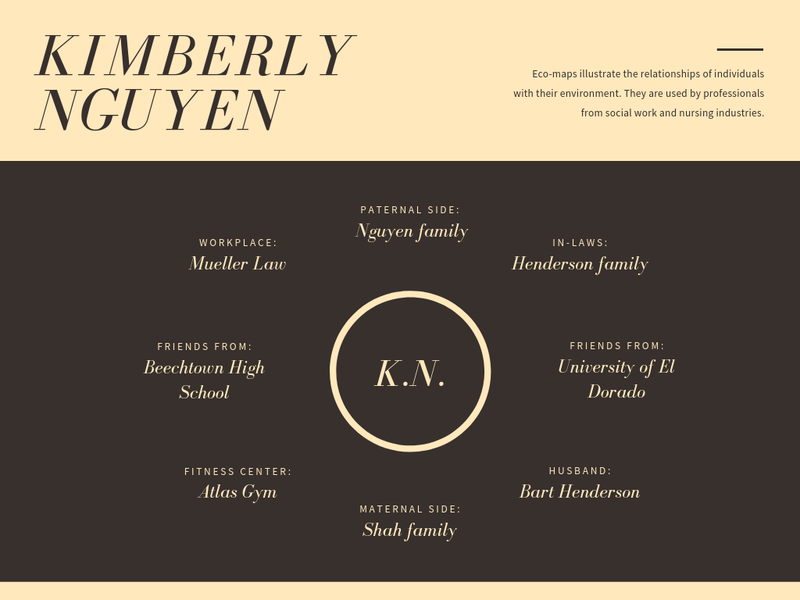 Every element in Canva is editable. Add, delete or copy shapes, icons, and lines. You can also recolor or resize them with a few clicks of your mouse button. Within minutes, you’ll have a completely new ecomap design ready to go. 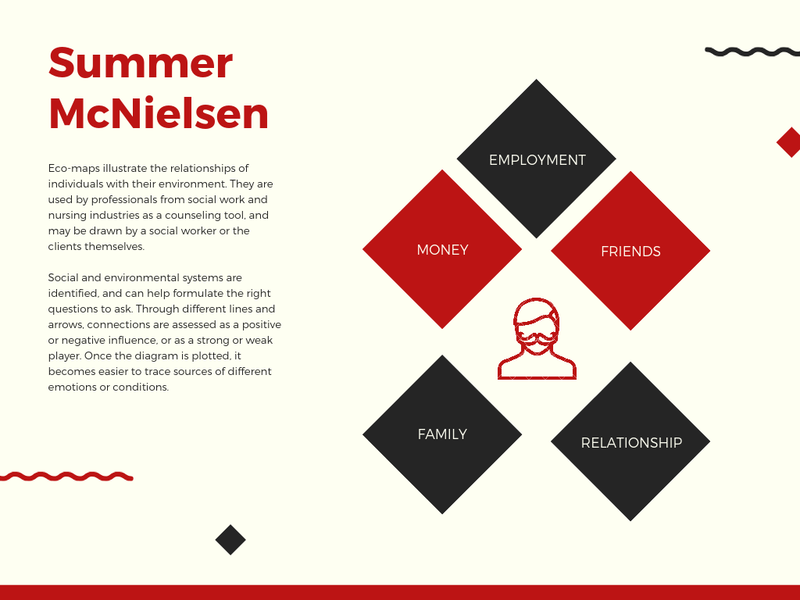 Like genograms, ecomaps use a variety of symbols, shapes, and lines to show interconnections and relationship dynamics. For example, thick, solid lines denote strong, positive connections while lines with hatch marks indicate stressful relationships. To add a shape or line to your design, go to the Elements tab, and click on the Shapes folder or Lines folder and choose one that works best for your needs. You might want to resize or recolor your chosen element. To resize, simply click and drag on any of its edges. To recolor, click on the element and use the color selection tool to pick any hue from the color wheel or type in a specific hex code. It’s that easy! Once you’re done creating the ecomap, you can show it to the patient or individual to start a discussion. You can choose to email them the file by clicking on Share and sending it to them. Or, you can bring a printed copy of the ecomap to your session by downloading your design as a print-ready PDF file and printing it in high resolution. Show them the ecomap and from there you can much more easily start a discussion about their family situation, their neighborhood and community, the strength and importance of these links, and whether or not they engage in any other activities outside of school or work. How can I format the text on my ecomap design? Ecomaps are usually a collaborative effort between the subject and their family. To share your ecomap template, simply tick the box next to “Share/email as an editable design”. 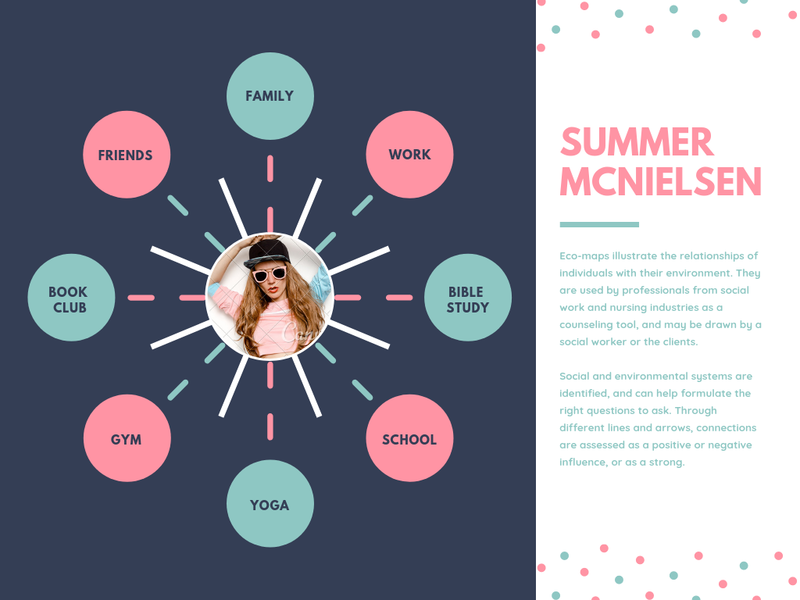 This will give them access to edit your design in their personal Canva account. There is no limit as to how many people can edit your design. Can I edit my ecomap after I’ve saved it? You can edit and save your designs as many times as you like. Every time you create a new collage it will appear in the “My Designs” section of your Canva homepage. You can also access all of your designs on the go by downloading Canva for your iPhone, iPad or Android device.